At about 11:00 am, I set up camp just outside the Grand Tetons in a grove of cotton wood trees. I can’t see the mountains from my campsite, but I do see them on every trip to the bathroom house. In the afternoon, I rode my bike on a trail from Moose Junction to Lake Jenny, a pristine, cold-water lake at the base of the Tetons. I decided that I didn’t want to bother with attaching my computer (which tells me how fast I am going, usually not very), or attach my tool pack (a small back with tie irons, a spare tube, and a few tools), or put on my bike shorts, or helmet. I just put on my cycling shoes and took off. The entire trip, I could see the Tetons. I have been trying to figure out why the Tetons are so stunning. Everyone who ever visits has seen it in pictures first, many times, and heard relatives rave about the beauty. 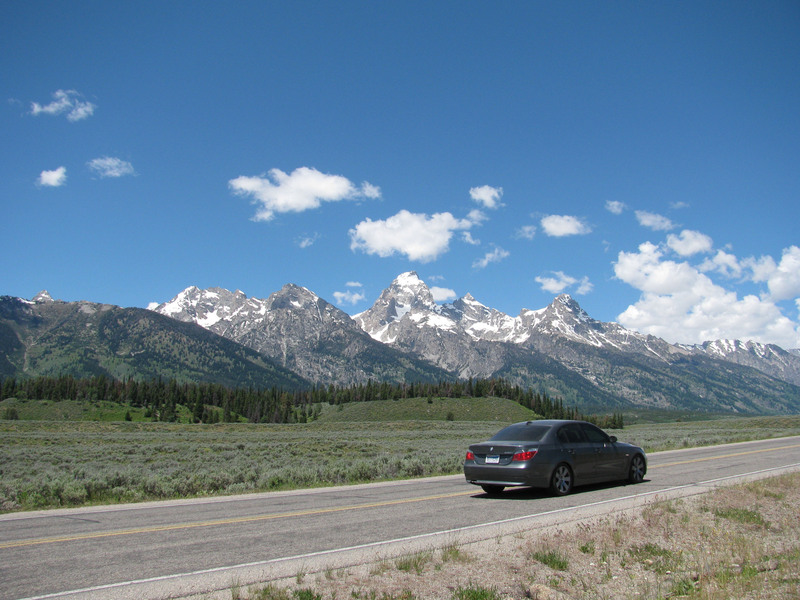 Still, when people look on the Tetons for the first time, they are breathless. Part of the shock of the Tetons is the way they seem to rise without warning from a nearly flat meadow, covered with wild flowers. But, most striking, I think, are the angles. From the right perspective, the ridgeline seems to cut into the sky. Each peak has facets that are as distinct as if cut by a jeweler. After my ride, I went into Jackson Hole to pick up a few supplies. It is full of art galleries and ice cream shops. Everyone looks like he or she just walked out of an Eddie Bauer catalog, or maybe it’s an Orvis catalog (Orvis clothes tend to be more expensive). I ate at the cheapest restaurant I could find (I didn’t feel like cooking in camp tonight); I paid $25 for a bad meal. It was only eatable because I had skipped lunch and was pretty hungry. I was able to eat enough that I didn’t have to stop at an ice cream shop on the way out. I went to my tent at about 10:30. I have a warm down sleeping back, but I had to get up twice to add more clothes. By morning, I had on two pair of socks, a pair of flannel pj bottoms, a t-shirt, a sweater, and a fleece jacket. I was still cold. The campsite is at about 8500 feet. Love that bit about Picasso and the Tetons. Glad it the Picasso reference made sense. One of the real problems with doing nature writing is trying to keep from saying, “I can’t explain this. You just have to see it for yourself. ” Even though, if truth is told, you just have to see it for yourself. Thanks Krista.